Inyo is the second largest county in California, with 10,135 square miles of area. The highest (Mt. Whitney) and lowest (Badwater) elevations in the continental United States are located here. Inyo's recorded mineral production has been more than $150,000,000 worth of silver, lead, zinc, copper, gold, tungsten, talc, borax and soda products. Several of the major gold producing areas (Reward, Skidoo and the Keane Wonder Mine) and most of the tungsten mines (located near Bishop) lie outside the California Desert Conservation Area under study and are not mentioned herein. These visitors, the first white men, women and children to visit this area, split up upon entering Death Valley into several different groups, each searching for a way around the Panamints and on to Sacramento or Los Angeles. They burned their wagons, slaughtered their oxen for food, and jettisoned everything not essential for survival. Water was as valuable to them as gold or silver. This silver discovery, known as the Lost Gunsight Mine, soon created a rush of it's own, and became a major incentive in the exploration and development of Inyo County. 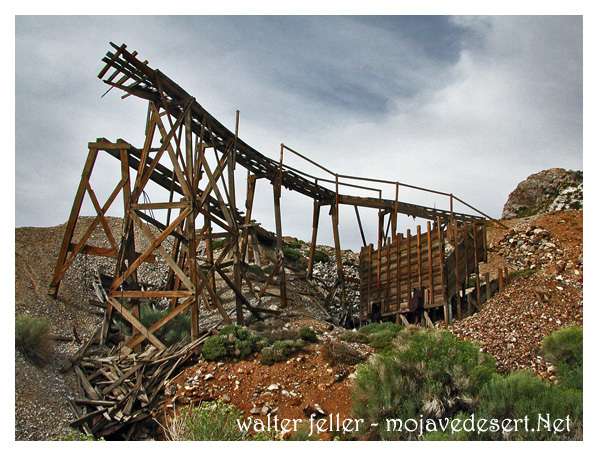 Inyo County's mining history is best related in terms of “looking for the Lost Gunsight”.